Immediate birth control is a choice many women in western cultures choose to prevent pregnancy in the months and years after giving birth, but birth control pills and other similar options are not always available to women in other countries. Researchers in India working out of KG Medical University, recently completed a study regarding the implantation of intrauterine devices (IUD) immediately after giving birth. India has one of the highest world populations and highest pregnancy/birth rates in the world. A total of 1,317 women participated in the initial implantation. About 79% (1,037) women reported to the first follow-up appointment six weeks after implantation. By the second follow-up at six months, about 10% of the IUDs had naturally displaced through expulsion. 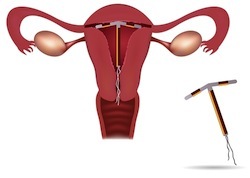 Conclusion: Researchers noted that the expulsion rate for women who received the IUD immediately after giving birth was higher than the general population with implantation independent of birth. However, the rate of expulsion was only 10%, leaving 90% of the IUDs in place; preventing pregnancy. The benefits of immediate implantation after birth outweigh the increased risk of expulsion, according to the researchers. Source: Shukla M, Qureshi S; Chandrawati. Post-placental intrauterine device insertion - A five year experience at a tertiary care centre in north India. Indian J Med Res. 2012 Sep;136(3):432-5.